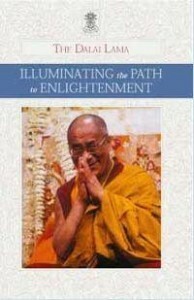 Illuminating the Path to Enlightenment was published in 2002 by Tenzin Gyatso, His Holiness the Fourteenth Dalai Lama of Tibet. The free ebook is essentially a commentary on Atishas Dipamkara Shrijnana’s A Lamp for the Path to Enlightenment and Lama Je Tsong Khapa’s Lines of Experience. Buddhism originated from its founding teacher, Shakyamuni Buddha , who gave 84,000 forms of teaching. Lam-rim means “stages of the path to enlightenment.” It was the great Indian master, Atisha, who wrote the first lam-rim text, A Lamp for the Path to Enlightenment, which condenses all 84,000 teachings into a single body of work. A a commentary on Atishas Dipamkara Shrijnana’s A Lamp for the Path to Enlightenment.